The state of the art display technology guarantees an optimum contrast, even with large viewing angle. The front panel fitting assures easy installation. Upon request, the devices are also available as turn-key system solutions in a stainless steel enclosure as wall, floor or ceiling mounting versions. An intrinsically safe USB interface is available for a USB Ex-i memory stick. Intrinsically safe input devices can be connected also. 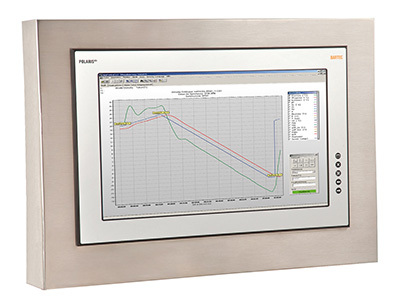 The optional (intrinsically safe) touchscreen offers the optimum in operating comfort. Windows XP Professional or Windows 7 can be used as an operating system. The Panel PCs therefore support the installation of numerous software packages, such as customer-specific software or other commercially available standard visualisation software.